First Recreational Building of the Year Underway! 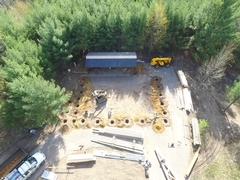 Two Story Recreational building South of Marshfield is underway. Not the simplest design, due to the fact that we are tying into an existing canopy. The guys are fearless and are doing an awesome job. Stay tuned for the completed project. You may see this one in our next commercial as well!